Centra ‘Starik’ barrel tuner. In opening the article I stated that I wasn’t an accuracy nut – I have a confession. Just as alcoholics don’t recognise they have a problem, I think we shooters don’t realise the depths we go to get greater accuracy, to that end I now have to admit I’m a nut. Hopefully, now I recognise my problem, I will be able to come to terms with it and exert some control. Looking about the internet, the BeeSting it at www.beesafeusa.com It’s a very nicelooking piece of kit. It comes as a tube only or with the tuner and can be made to any length price. 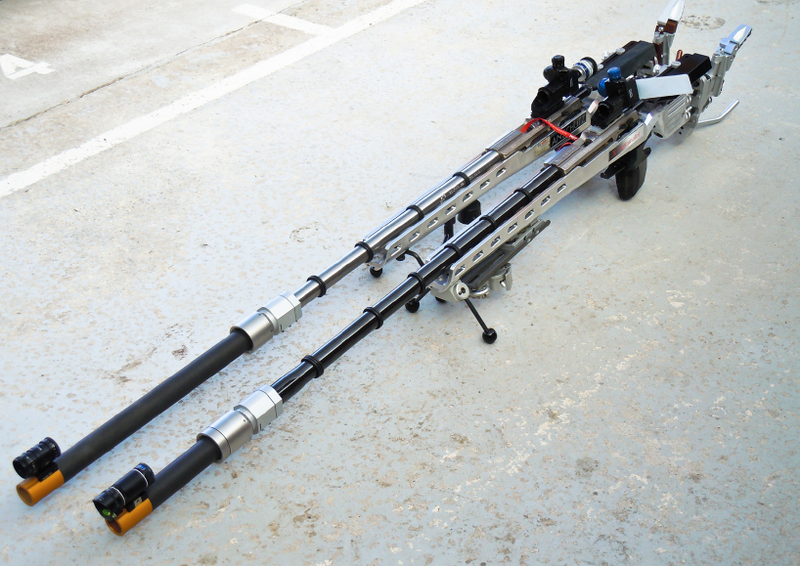 Interestingly, the tube itself is made against any comparable length metal tube. Unlike the Starik, it’s tuning movement is, by comparison, minuscule and again, unlike the Starik, it has a micrometer to record settings, making return to any previously tuned setting for ammo batch or distance very easy. My ‘weakness’ kicked in, the wife’s jewellery would have to be pawned, I had to have one. A good friend and fellow member of DTSGB and I of using a tuner. We showed, in the last article in July tuned to shoot even smaller groups. 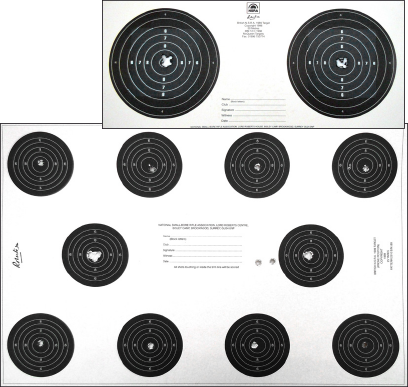 In an international competition shot using electronic targets recording scores to 0.1, every 0.1 improvement counts and a tuner could make the difference between wining Gold or being an also ran. To many shooters, it will make the difference between scoring a ten or a nine. My friend has a 21inch Lilja barrel and was looking for an extension tube so, I suggested he take a look at the BeeSting. He placed an order for a tuner with a 15inch tube and I followed a couple of a day later requesting an 8inch tube. Tarl Kempley, shooter and designer of the BeeSting,set up payment via PayPal then sent tracking details. Starting in Carson City, it traveled to Phoenix, then LA, in and out of US customs, then a couple of days later it arrived in GB – into our custom and out (3 days) – finally arriving at ParcelForce where, having paid the import duty, I took delivery. On arriving home I eagerly opened the box. Together with the tuner/tube is the location ring, suitable allen key and a book of instructions. I also ordered an extra weight (optional). I have to say the BeeSting is as good looking and as well made as it looks on the web site but, would it produce the results I wanted? Following the instructions, I soon had the BeeSting fitted and ready to shoot. My friend called to say he had had problems getting a zero at 25 yards and was going to fit a riser block to the rear sight. 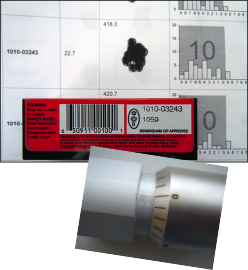 On examination of the carbon figure tube I found it to be about 2mm larger in diameter than the fire muzzle account for the inability to get a zero at 25 years. Amongst all my bits I had an 8mm block, so fitted that ready to shoot the rifle that evening at 25 yards. As is normal when first shooting with a tube, it’s not always possible to have a zero from the word go – you will see my first shot was wide by the black by three quarters of an inch. Adjusting windage, my next was a quarters of an inch. Adjusting windage, my next was quarter of an inch off the black. Giving windage a good wind by luck more than judgement, my third shot went inside the bull at 9 ‘0’ clock. A couple more clicks and I shot another four rounds through the same hole. Moving to the left-hand middle diagrams – five shots clean in. Then, starting top right to left, all shots clean in, then bottom right to left all clean in. So, once on target, I had 18 consecutive bulls. The next question was how would the BeeSting perform at 50m? Examining the rear sight elevation the following day I thought the 8mm riser to be a little high so replaced it with a 4mm unit. My first outing at 50m was a dull, windy day, the clouds were clearly rattling by right to left and the weather forecast gave wind speed at 12mph – not ideal. I had acquired a couple of thousand rounds of Tenex at the right price and decided to use that. Looking at the batch number I seemed to recall testing it at Eley, so dug out my test results over the past couple of years and sure enough there it was. It had a consolidated score of 22.7mm edge to edge after forty shots had been rejected – I had bought a batch that gave far better results. This would really test the effect of having a tuner, could it improve the ammo good enough to hold the bull? Following Tarl’s instructions, I shot using the mid setting – clearly the group was quite spread. Turning the weight five marks rearward gave the little improvement, then another five and another, it seemed to be getting better but I wasn’t happy. I was getting very cold so I eventually called it a day, a little disappointed not having found a good tune. My next outing was with my friend who also needed to tune for his 50m but, after expending another box and more of ammunition in very good conditions, it didn’t seem any better. Today I went back to the range with Celia my shooting companion and decided to wind the weight forward of the mid setting. After fifteen shots I knew it was going in the right direction, I had it in tune just 17-18 marks forward and began to settle down to shoot some serious groups. I wanted at least a card scoring a ton, time and again I fluffed the odd shot scoring 99 with tight grouping then did what I had set out to do – a ton. Remember, this is with rejected ammunition and me shooting from my wheelchair – not the most stable of platforms because it has suspension. Having used the Starik tuner for the last year, I have come to appreciate its benefits but without any reference marks it’s just not possible to revert to a previous setting for a different batch or distance shot. I also like to shoot at 100 yards and this has a different point of tune. 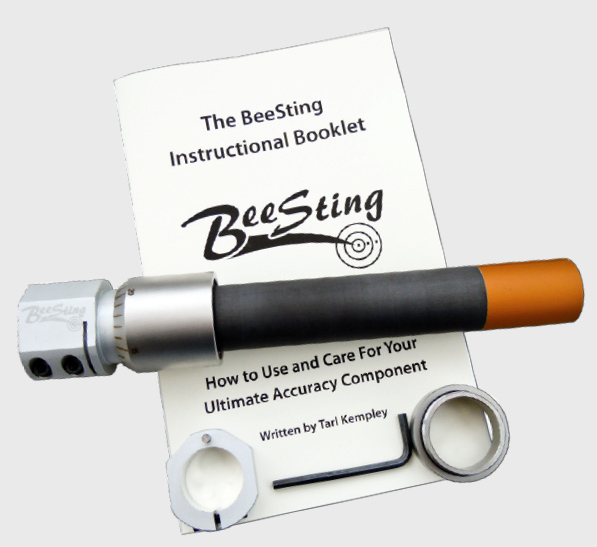 The BeeSting overcomes this with its micrometer setting marks, coupled with the ability to have any size tube up to 15 inches and longer – if you pay the extra and it comes with an instruction book. Given a choice, despite the extra cost, the BeeSting is the better by far. I think it self evident from this article that I'm a fan of tuners.